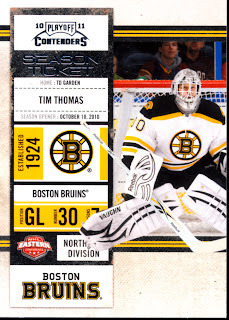 All About Sports Cards: Canucks defeat Bruins in game one. 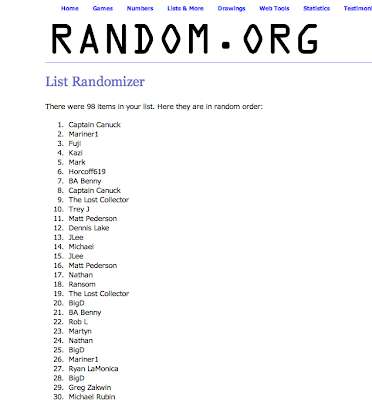 A recap and the winners of our Stanley Cup Playoffs Contest. Canucks defeat Bruins in game one. 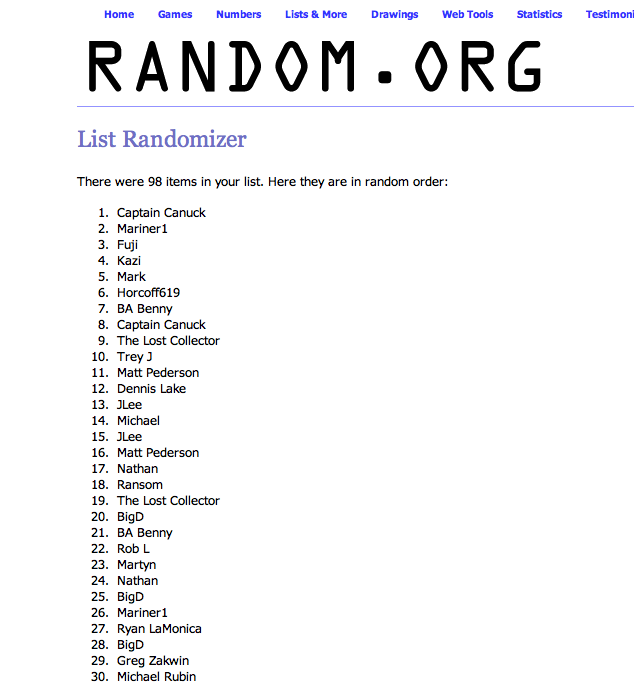 A recap and the winners of our Stanley Cup Playoffs Contest. Tonight's first game of the Stanley Cup Finals was all about the men in goal, Roberto Luongo for the Vancouver Canucks and Tim Thomas for the Boston Bruins. 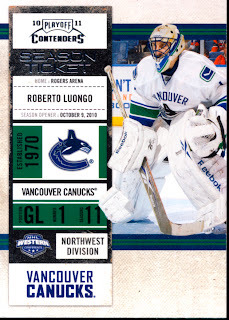 For 59 minutes and 41 seconds they were both perfect with Luongo absorbing 36 shots and Thomas 33 shots. 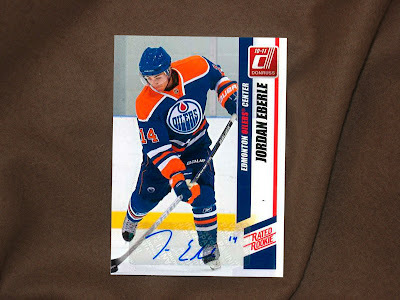 Depending on how you look at it, as a product of Johnny Boychuk suffering from mental fatigue, a brilliant circus like move by Ryan Kesler to strip Boychuk while defying physics to prevent an offside, Thomas was doomed to let one go by as Janek Hansen caught a cutting Raffi Torres for the redirect. 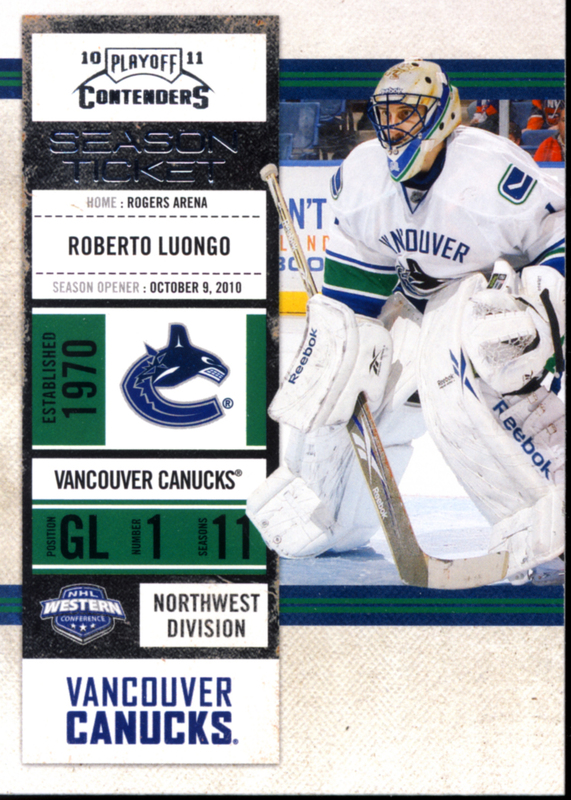 So the Canucks go up 1-0 for The Cup, but this should be a long, hard fought series due to the two men you see pictured above on their 2010-11 Panini Playoff Contenders cards, which, by the way, we should have the video box break posted soon. 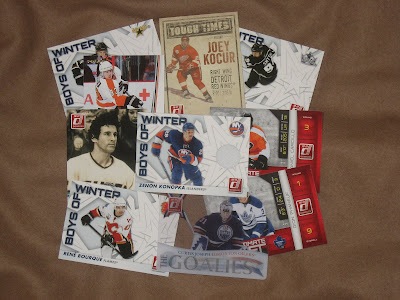 The box break has happened, I'm putting the video together and I will tell you it is a MUST see. An amazing box, heart stopping you might say. But we also have some unfinished business to attend to. 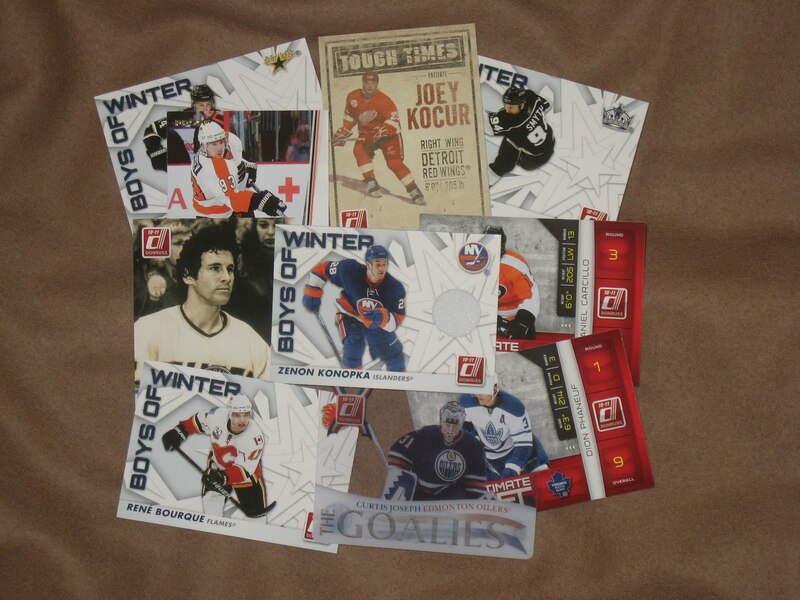 An announcement of the winners of our Stanley Cup Playoffs Contest with some great 2010-11 Donruss cards thanks to the good folks at Panini America. Congratulations to the winners. 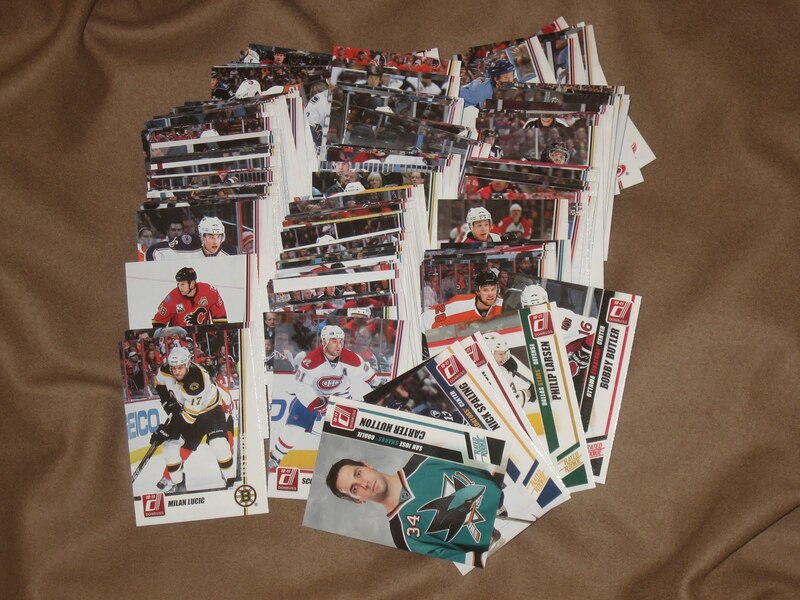 Please send you address so these great cards can get to you. Thanks to Panini and everyone who participated. 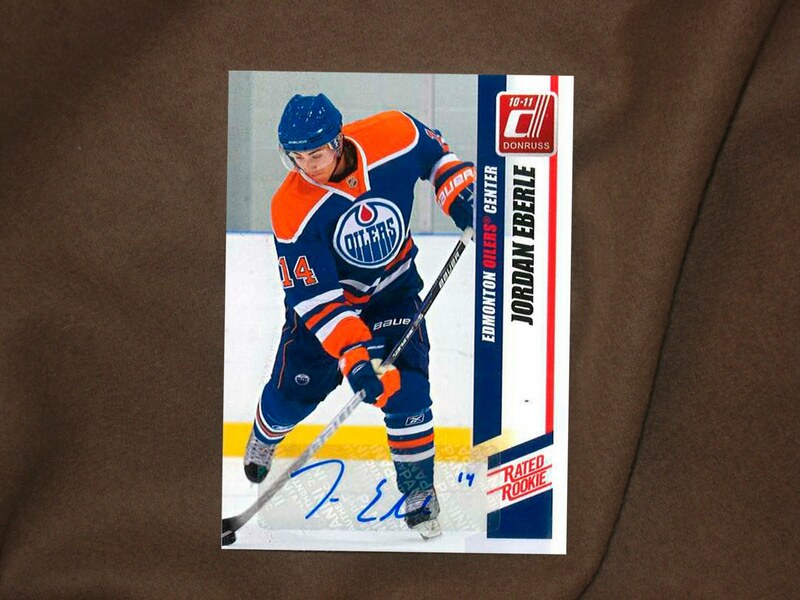 Make sure you check in to see what we pulled from our 2010-11 Panini Playoff Contenders NHL Trading Cards tomorrow.